Pottery Barn Warehouse Clearance - Save Up To 75% | A Savings WOW! One thing we love about the weeks after the holidays are the post-holiday clearance sales! Pottery Barn is having one with savings of up to 75% off the original price. One of the items we liked is the Antique Bar Ice Bucket (shown above). Originally $29, it’s on clearance for $9.99. 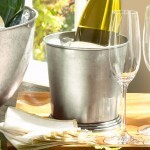 This ice bucket would make a great gift for the upcoming wedding season for wedding showers or even as a wedding gift! It is also great for any entertaining you plan to do throughout 2012. There are many more clearance items to choose from, including bedding, home decor, gift items, and seasonal decor. Check out Pottery Barn’s Warehouse Clearance sale!